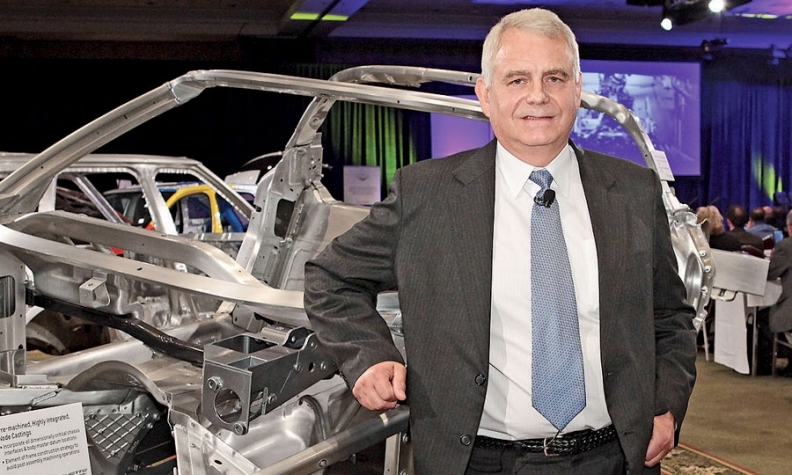 Mike Regiec, General Motors senior manager of global body-in-white, with a 2014 Chevrolet Corvette body-in-white. GM eliminated 2.2 pounds from the Corvette by developing a spot welding process that replaced rivets used to join aluminum components. While most fuel economy gains will come from more efficient powertrains, shedding weight also can help. Automakers improve fuel economy about 1 percent for each 110 pounds they remove from their design, regardless of other changes. "Somehow, these vehicles are going to have to become lighter and stronger simultaneously," said Jim Keller, vice president for auto development strategy at Honda R&D Americas Inc., which recently developed the 2014 Acura MDX crossover. So automakers are turning to new designs of older materials, such as high-strength steel, plastics and aluminum, as well as more cutting-edge uses of magnesium to shed weight in body-in-white. They're also looking at fasteners as an area ripe for weight savings. For instance, General Motors eliminated 2.2 pounds from the 2014 Chevrolet Corvette Stingray by getting rid of rivets traditionally used to join two aluminum components. GM developed a spot welding process that replaced the rivets. In other weight-cutting feats, Jaguar-Land Rover used a variety of material and process changes to make its large premium SUV, the 2014 Range Rover, 881 pounds lighter than its predecessor. And engineers at Honda made the 2014 Acura MDX 275 pounds lighter than the previous year's version. The corporate average fuel economy standards revised in 2012 reach 35.2 mpg in 2016 and get progressively tougher through 2025, when automakers must meet an average standard of 54.5 mpg across their fleet.